I think we can all notice a theme developing here. I did a room tour a few weeks ago (here) and although you only saw snippets, my room is filled with owl items, shabby chic decor and floral patterns. This wish list is just a little expansion of my love for these things. I'm planning on buying a few more in a couple of weeks time to add to my room and after browsing amazon these things caught my eye. 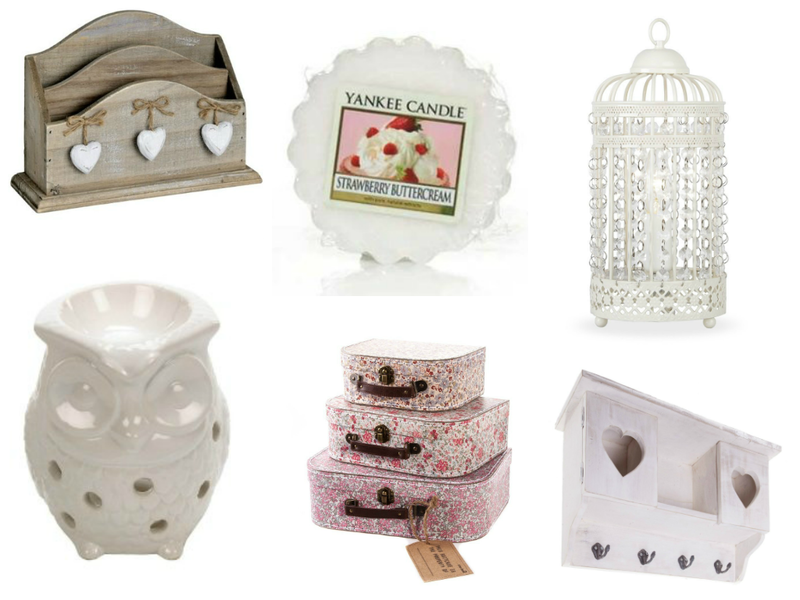 My favourite item has to be the birdcage table lamp. I was looking for a new pretty bedside lamp and this one looks perfect. It costs only £19.99, but I think looks a lot more expensive. It's different and unique and I really like it. I need more storage space in my room, I have wardrobes and a cupboard in my room, but it's full of other stuff that my parents put in here when I was at university and there isn't enough space for my things, so I've been looking for some attractive storage items. I really like the vintage style floral suitcases and they would make the top of my wardrobes a lot more attractive! The heart wall cupboard would also be a nice addition to my room without taking up any floor space. Next up are some decorative items. I love the style of this wooden letter rack. I have a section in my room with lots of paper and magazines and it's just in the way. Something like this would make them look more organised. I already have a yankee tart burner, but I saw this owl oil burner and I couldn't resist adding it to my wishlist. It's obvious I like owls by the title of my blog and the many owl ornaments I have around my room, so I am very tempted to add this to my collection. And finally, the strawberry buttercream wax tart. I haven't actually smelt this tart before, but I am a big fan of sweet scents and have many cake scented candles in the past. This one sounds delicious. Do you own any of these items? Which is your favourite?